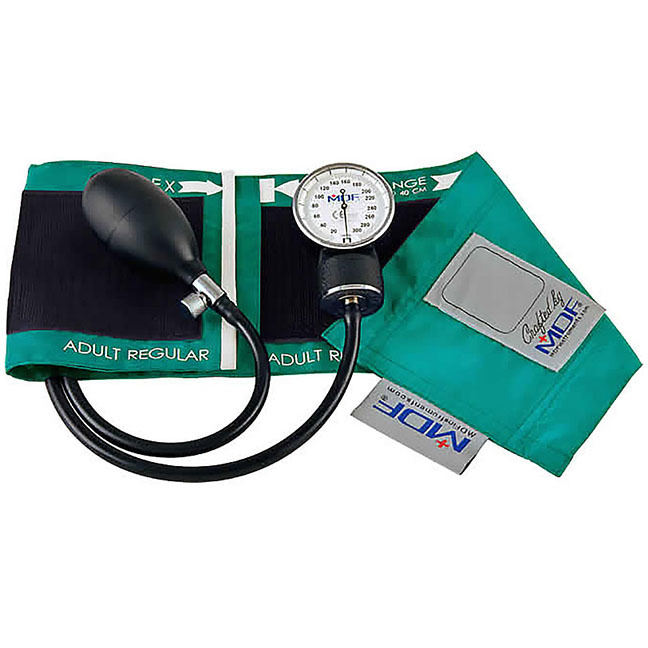 Gauge: A precise, certified 300 mmHg manometer attains the accuracy of +- 3 mmHg without pin stop, and features an easily identifiable high-contrast dial. The die-cast zinc manometer housing is finished in textured baked enamel and outfitted with a heavy-duty clip so it can be easily attached to the gauge holder on the cuff. Cuff & Inflation Bag: Resistant to abrasion, chemicals (chlorine and peroxide), and moisture, the adult Velcro® cuff is constructed of high-molecular polymer nylon. Sized to meet American Heart Association recommendations, the artery indicator label and index range further ensure proper cuffing for correct arterial compression. The double tube seamless inflation bag is constructed of crack-resistant, non-sticking, high-density hypoallergenic latex-free PVC. The universal bladder tube enables compatible cuff exchange with all MDF® and other major brands of blood pressure systems. Included Accessories: Nylon zippered carrying case with Velcro® side pocket, ID tag.